With influences ranging from 19th-century Chinese motifs through to the cool glamor of Art Deco, the new floorcoverings from Flair Rugs capture the essence of the original designs and craftsmanship documented in the V&A. 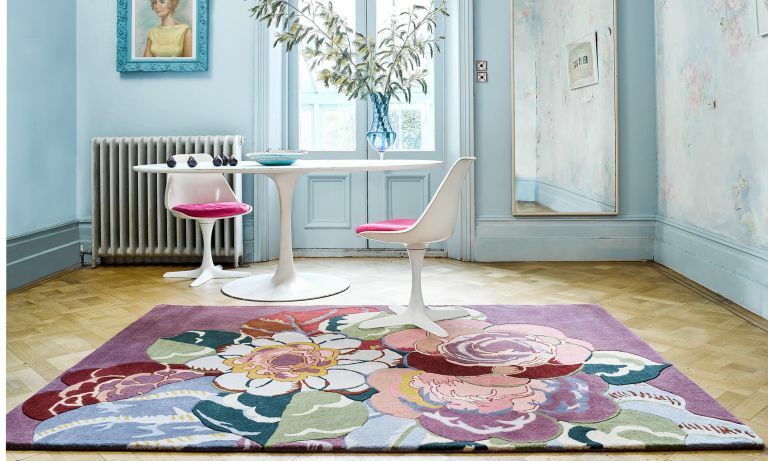 From bold abstract prints and delicate chinoiserie, art deco glamour and a fabulous floral, there's a rug in Flair Rugs' Luxmi collection to suit most interior styles. Inspired by a fragile piece of Chinese wallpaper from 1860, Phoenix features a mythical bird as its central motif, surrounded by peonies. Hand-tufted in India and tip-sheared to evoke the delicate beauty of the original work, Phoenix is available in three standard sizes in a duck egg blue and ivory colourway in hardwearing 100% viscose. Prices start at £335 for a 120 x 170cm rug. Drawing inspiration from the familiar motifs of the Art Deco period, Moderne, references bold, geometric forms in a smart brown and ochre colourway. Inspired by a 1930s hand-knotted former hotel carpet given to the V&A by The Savoy Group, this rug is typical of the Art Deco Movement and undeniably stylish, hand-tufted in a wool-rich/viscose blend for extra luxury. Prices start at £335 for a 120 x 170cm rug. The Rhythm rug is based on a print by Allan Walton Textiles in the V&A’s furnishing fabric archive. The rug's design references the bold, rhythmic composition found in the archive piece, recoloured in a grey and ochre colourway and is part influenced by the style and vibe of 1930s ocean liners. Hand-tufted in India from 100% wool, Rhythm is priced at £335 for a 120 x 170cm rug. The work of French artist, Edouard Benedictus, inspires the Rosa rug, which takes a detail from the artist’s 1924 portfolio of exquisite prints and vibrant design ideas intended for furnishing fabrics and wallpapers of the day. Flair Rugs has enlarged the scale and introduced a contemporary and seasonal colour palette for Rosa. Hand-tufted in India from 100% wool, this rug makes a statement in any room. All rugs are available in three standard sizes of 120 x 170cm, 160 x 230cm and 200 x 290cm, priced from £335. The new additions join existing V&A Inspired designs – Jazz, Honeysuckle, Fanfare and Rhapsody – in the Luxmi collection, creating a series of beautiful rugs inspired by the world’s leading museum of art, design and performance. The rugs are available from leading retailers up and down the country.